When I am down with cold or fever, I generally resort to a set of recipes that clears my nose. These recipes are easy on stomach, but not light on flavour; meant to kick start our system with a spicy jolt. Like spicy tomato soup/rasam, Pepper-cumin-garlic rasam, and now miso soup. My love for miso is not new. Mellow, but salty, miso makes a great soup. The broth is infused with spicy ginger and fragrant lemongrass and the noodles and tofu are let to soak up the flavour. I made up this recipe according to my tastes; feel free to modify it by adding mushrooms or mixed vegetables. Boil 4 cups of water with miso, bouillon, ginger, lemongrass and chilli for about 5 minutes. When the flavors have infused well, remove and strain. Transfer the stock back to the sauce pan and bring to a boil. Add udon noodles and cook in the miso broth. When the noodles are almost cooked, add tofu cubes and allow the soup to gently simmer, for about a minute. Let the noodles to cook thoroughly. Ladle onto bowls and serve hot topped with scallions and shredded ginger on the side. Tofu is a good vegan source of calcium. 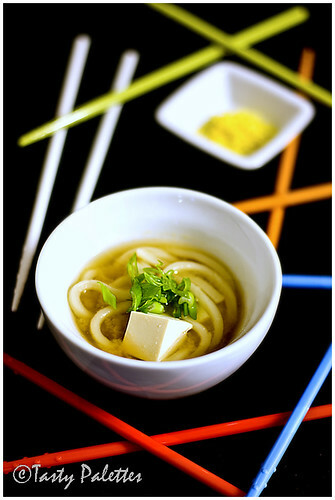 Japanese udon-tofu soup is my entry to Beautiful Bones, hosted by Susan of Food Blogga. Its an event focused on bringing awareness about osteoporosis. I love tofu in any incarnation. This is a lovely soup! beautiful soup - i love udon too! This is just my kind of soup. Boldly flavorful with thick, chewy udon noodles to slurp up! Thank you for a lovely entry. 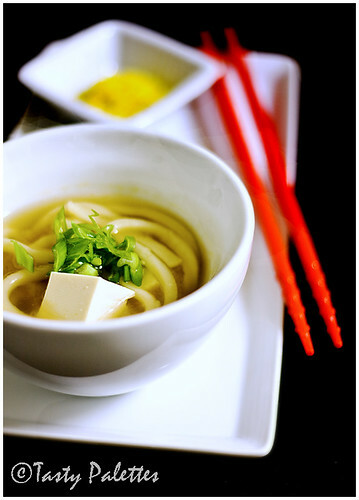 Udon, miso, and tofu are some of my favorite things- This sounds like it was meant for me! Ginger and lemongrass are definitely great flavours when one is down with a cold. That soup will cure any ailment. Loved all what you did with Buddha's hand. Never mind the soup - I love, love, love those colourful chopsticks! Gorgeous pictures and recipe. Those chopsticks practically glow in the dark, very dramatic and stylish. Beautiful soup. One variation you might like to try (if I can be so bold) is to add the miso paste at the end. Miso is a live culture and boiling will destroy it. Adding it at the end will retain the culture. I agree with you - miso is wonderful. Loveee the splash of colors.. and the soup too!! Thanks to everyone for leaving your trail here. Your nice words are appreciated. Felcy, if your question is about the background, then they are charts bought from craft stores. They come in a variety of colors to choose from. VY, Please don't hesitate with any suggestions you may have. Miso is new to me and I didn't know that it shouldn't be boiled for long. I will try your method next time I make the soup. Thank you for your valuable input. I need to get Miso asap now. Everytime I keep dilly dallying since I am not sure I can make use of it all. And thats a nice tip from Vegeyum. Thank you. Thanks suganya. Charts!!!. It looks like real counter top. Amazing fotography...!! !